BCSWMD's Education Coordinator can provide classroom and community presentations at your location upon request year round. Please contact Kari Spurgeon, Education Coordinator by calling 812.376.2614 or email at kari.spurgeon@bartholomew.in.gov to schedule yours today! Below is a listing of given presentations or download our New Education Resources Guide. Recycling Superheroes (Pre K-1st) (45 min- 1 hr)- Become a Recycling Superhero! Students will learn how to recycle by sorting through a pile of solid waste and separating materials into the correct bin. Students will learn that waste materials end up somewhere; they do not just "go away". It Leaks to Creeks (Pre K-1st) (45 min- 1 hr)- Students will learn the importance of preventing pollution by taking part in an interactive story. Students will propose ideas to prevent future pollution. 3 R's (2nd -8th) (45 min-1 hr)- Students will learn the meaning and concept behind "Reduce, Reuse, Recycle" by participating in an engaging presentation. Hands-on examples of each "R" will be provided! 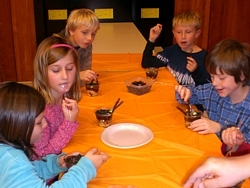 Edible Landfill (3rd-8th) (1 hr)- Students will learn about the construction, function, and contents of landfills everyday by constructing their own edible landfill made of yummy goodies! Also, students will learn the value of recycling and waste reduction through a visual example. Reuse (K-6) (45 min-1 hr)- See trash turned into treasure! Students will learn the importance of Reuse by seeing what treasures can be created from trash. Participants will reuse items from those received at the Recycling Center to create a craft. Crafts are limited to supplies available. Household Hazardous What? (4th-8th) (1 hr)- Students will identify a number of household products and learn how they are used as well as how to sort. They will sort items into the various types of household hazardous waste. Students will discuss how the improper use and disposal can affect people in their community and environment as well as learn alternatives. Compost: Earth Recycles (Pre-K- 2nd) (45 min-1 hr)- An introduction to Earth's natural method of waste disposal. Using a rhyming story and interactive activities, students are introduced to the concept of waste reduction through composting. Who Polluted? (2nd-6th) (1 hr)- Through an interactive story, students experience pollution of a river over time due to runoff, personal decisions, and land use. The group will experience how hard it is to clean-up pollution. Business Recycling- How do I Get Started?